Japan is one country in Asia that has a variety of uniqueness in the culture. The uniqueness of Japanese culture can be seen from the traditional dress of kimono and style of his own house. The design of a minimalist house with a Japanese style is being much in demand of many people. The concept used Japanese style house is lesehan in some parts of the room. 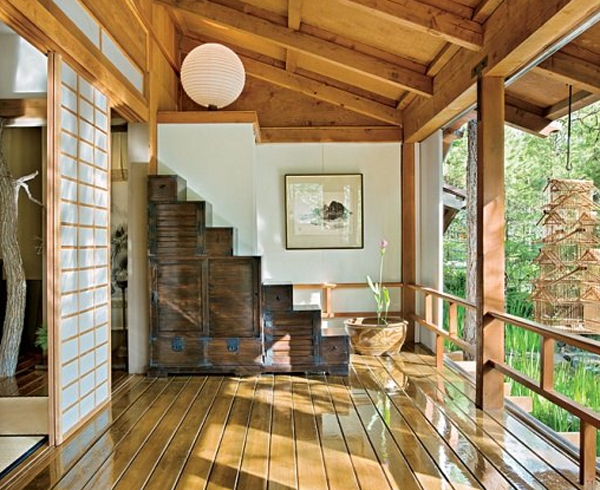 Japanese home style designs are usually made of wood and use sliding doors. # 1 House with Japanese style generally has a natural feel made as comfortable as possible. These natural shades are visible from the wooden house walls, then also the sliding doors with a small sound, and the lights are yellow. # 2 Wall color and home furnishings are chosen from a combination of brown and white colors that will give the impression of warmth. This color combination will provide comfort and great fun. # 3 Tatami or a typical Japanese floor is a floor that is held with a mat made of straw or reed plants. This mat will provide warmth when you relax with your family while drinking tea or sleeping. # 4 Living room without roof for fresh air or sunlight to enter the house. The living room that is given this floor is very fun to use an event like a BBQ party, and others. # 5 House walls made of wood, generally the back of the house to be dominated the installation of wooden walls so it looks very natural. Grayish-brown color that comes from wood texture will also add beauty. A few Japanese style minimalist house with some designs that are usually often found in Japanese-style homes. You can also customize some of the designs you want to suit your comfort as well as your family.